It’s the Valentimes day, and in honor of this day of luuurve, here are two doodle type things. The first is a drawing I did for my mom. Since we are living in my parents house temporarily, its no trouble to update her framed chalkboard thing. It’s totally the thing to have a bistro style chalkboard in one’s house and update it with seasonal images or messages. 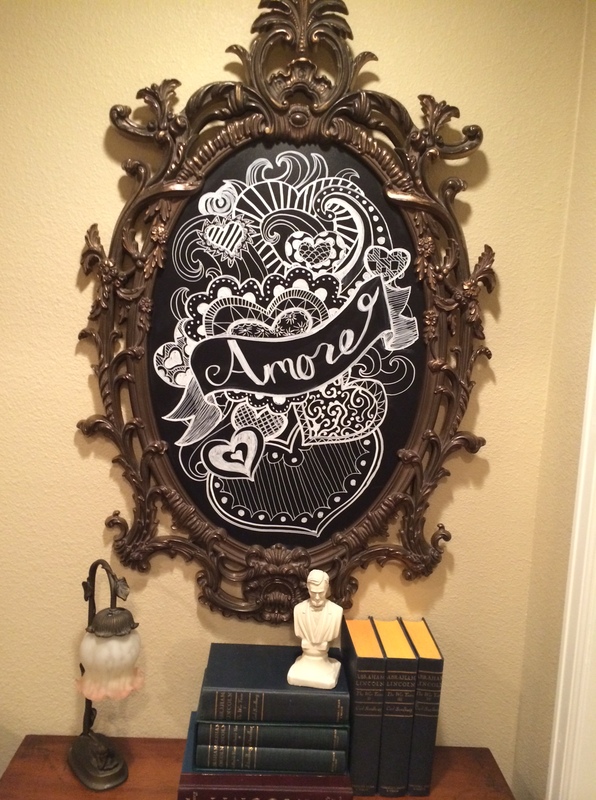 My mom has done one better and framed her chalkboard in this amazing frame. To do the actual drawing, I used a special liquid chalk marker. It’s pretty sweet and erases easily with water once you are done with one design and need to update for the next month ( St. Patrick’s day anybody?). I though Amore would be better than plain old English “love,” although with the curlicue thing, it looks kind of like Amoree. And if you are wondering, yes, that is a tiny bust of Abraham Lincoln. My mom kind of has a thing for our most awesome of all the Presidents. Bistro Chalkboard meets epic frame of epicness. 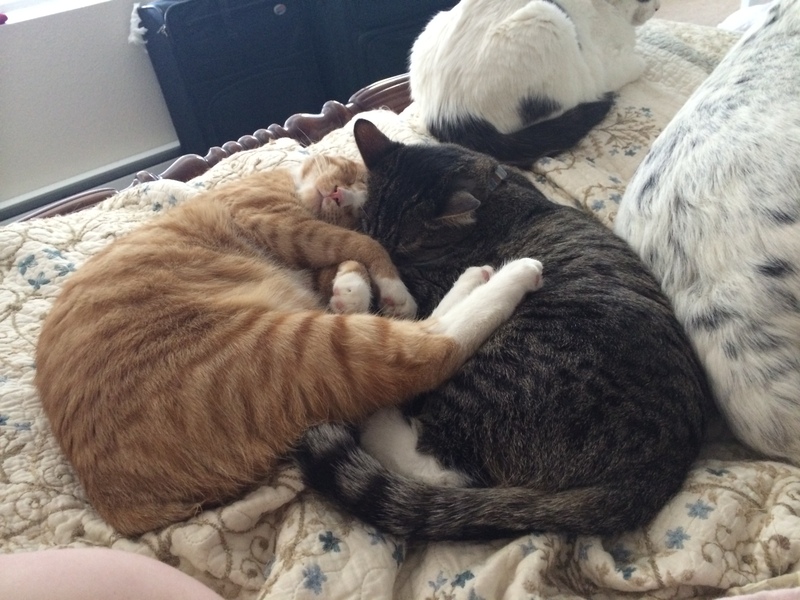 Cuddling time is very important to the kitties, and this was just so perfect for Valentines day, I had to take a picture. Hearts are kind of a crap shoot when it come to me drawing them. They are a simple shape, but the slightest mistake is really noticeable in terms of symmetry. In the past, I’ve used hearts very seldom, and usually have made them unsymmetrical on purpose. 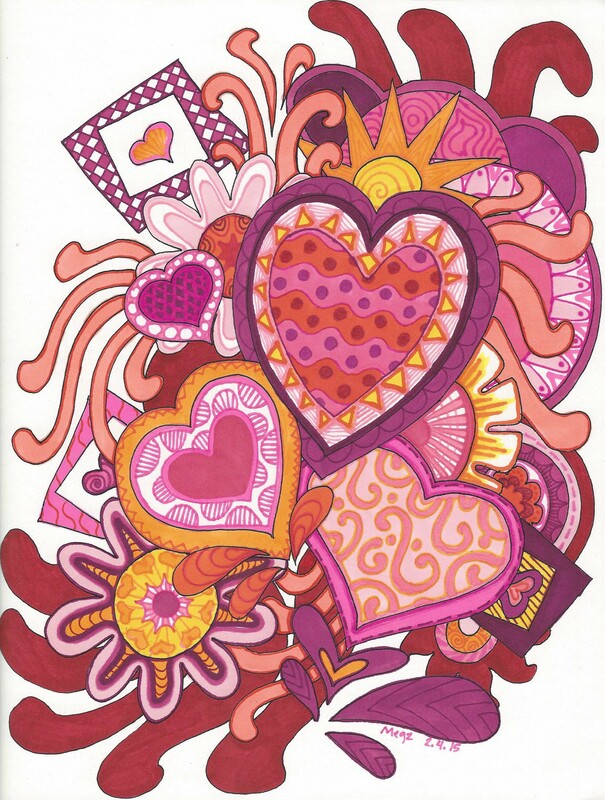 to make up for any mistakes in the shape of the hearts, I colored this doodle in Heart Attack pinks and oranges. I think a few hearts were squished in the dog pile, which is where the peach and red gushing streams are coming from.